Efforts by the Brazilian government over the past 15 years to curb deforestation have been a widely celebrated success, but a new study finds that there’s more deforestation happening in Brazil than official accounts suggest. 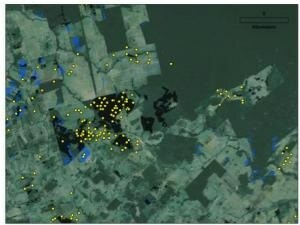 The study, led by researchers from Brown University, compared data from Brazil’s official Monitoring Deforestation in the Brazilian Amazon by Satellite Project (PRODES) with two independent satellite measures of forest cover. The study found that about 9,000 square kilometers of forestland not included in PRODES monitoring were cleared from 2008 to 2012. That’s an area roughly the size of Puerto Rico. The research is published in the journal Conservation Letters. PRODES has been a key part of Brazil’s effort to curb deforestation, an effort that has had significant success. In 2003, 25,000 square miles of Amazon rainforest were lost to deforestation. That dropped to an average of 5,300 square miles between 2009 to 2013, according to the PRODES monitoring system. The problem, the researchers say, is that PRODES monitors only primary Amazon rainforest. It excludes dry forests, another critical biome in the region, as well as secondary forests — land that was cleared many years ago and has since become reforested. PRODES also excludes discreet forest plots smaller than 6.25 hectares (about 15.4 acres). Physical Properties Testing of Polymers - Are They Better Than Plastic? The independent measures of forest loss used in the study came from the Global Forest Change project and the Fire Information for Resource Management Systems. The 9,000 square kilometers of untracked deforestation that the study found could have ramifications beyond the loss of critical forests. Brazil uses PRODES to calculate how much greenhouse gas the country emits through the burning of forest biomass. This study suggests that Brazil’s deforestation-related greenhouse gas emissions are nearly twice as high as PRODES estimates. VanWey and her colleagues say their results show that Brazil needs to update its detection and enforcement strategy to better reflect the realities of land use on the ground. VanWey stressed, however, that the news from this research isn’t all bad. The study verified that Brazil’s efforts to curb deforestation have been successful, albeit with important caveats. Peter Richards, an economist with the Bureau for Food Security at USAID, led the research while working at the Institute at Brown for Environment and Society. In addition to VanWey, co-authors were Eugenio Arima (University of Texas), Avery Cohn (Tufts University) and Nishan Bhattarai (Tufts University). The research was supported by a National Science Foundation Fellowship in Interdisciplinary Research in Behavioral and Social Science Research Award (#1305489).